Sunanda Pushkar was a gutsy lady. She lived on her own terms. Her life-story shows that she was no stranger to ups and downs, having survived many tragedies in the past. Each time life served her a shock, she was ready like a shock-absorber and emerged stronger. I admired her all the more when I saw her life-story recently. Like most people, even I knew about her from the IPL news headlines, her marriage to the author & minister… and would never have known so much about her but for the Social Media episode followed by her unfortunate death last week. Last Friday, I was totally shocked when I saw a tweet “RIP Sunanda Pushkar”. I was busy with my First Twitter Quiz As Curator & came to learn of the breaking-news late, that too from Twitter where the drama of accusations and counter-allegations had all begun some hours ago. It was, and still is, hard to digest… Why would such a person with a zest for life, end her own life herself? But, speculations are rife… Autopsy report shows 27 tablets of Alprax have caused her death. They even looked for the absent ‘suicide note’. But, why was her life cut short so abruptly? I feel she had access to confidential info... What was that secret that triggered her murder? Sunanda was not the average Indian woman. She was self-made and successful and a wealth-creator of crores of fortune. How many Indian women are that modern and go for a third-marriage? It takes guts to do what we wish to do. It takes courage to voice what we exactly feel in life & in Social Media. Social Media is a part of life now. In this fake world, everyone paints an ‘All Is Well’ picture, shoving everything under the carpet & putting skeletons in the cupboard, though the reality is starkly different. But, if the wife indulges in an ‘affair’, it’s sacrilege! Even if she is totally pure, still her character is suspected. In the Ramayana, Maryada Purshottam Lord Shri Ram had asked his wife, Devi Sita to prove her chastity by the Agni Pariksha. When Gods behave so, what can we say for the lesser mortals on Earth in the KalYug?! But, Sunanda even countered her husband’s claim when he said that his Twitter account had been hacked. She stuck to the truth & owned up that she had leaked those BBM messages. She stressed that she never lies. 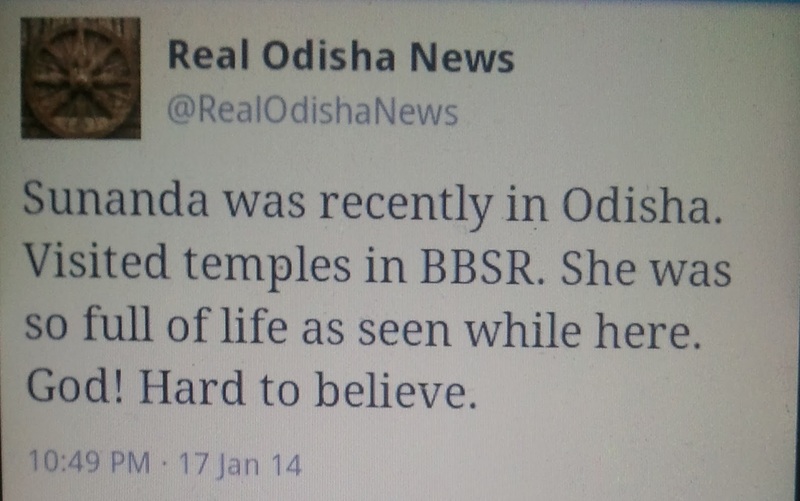 As per the statement released, Sunanda was very 'ill'. If yes, why was she shifted to the hotel instead of the hospital? Why was she 'ill' in the first place? In this News-Video, Rahul Kanwal speaks about Sunanda Pushkar. Who bruised & killed her? Why did Sunanda have to pay with her life? Being forthright, earnest and honest kills? Will the guilty be brought to book for cutting short a beautiful life? Will there be justice for Sunanda Pushkar? A very brave and heartfelt tribute to a very deserving lady.Great job. Thanks for stopping by and sharing. I am deeply disturbed and just put my thoughts. Glad you appreciate. Honest opinions reflect an honest person. a great tribute post to her. very well written, Anita. Thanks Meera. She really deserved better. Sad about having to write tribute for such an ex-full-of-life person. I appreciate your honesty, integrity and courage. To more like you. But please be careful! All the best. Thanks for the recognition, support & concern. Thanks for the heart comment. I too feel she isn't the kind to commit suicide, at the same time I can't believe ST is the kind to commit a murder. Su must have panicked with all wrong things happening in her life. Her auto immune disease, a disease that has no known cure must have frightened her and ST's mail exchanges must have made her insecure. I feel she took the overdose without knowing the consequences. I may be wrong but till something concrete comes up I cannot believe otherwise. I had to share my anguish and chose this way through my Blog. If contrary to her never-give-up nature she did take the overdose herself, then how can the bruises on her body be explained? Hope there's fair investigation in which Satyameva Jayate and she gets justice. Great tribute to a great lady.. It is sad that a love story which was celebrated by the media has seen such a sad end. Let us all hope she finds justice. I don't know why..but I don't trust politicians. Thanks Preethi. I have quoted you in my Post. Hope you saw that. Great tribute to the lady. She was one of the biggest female entrepreneurs. Thanks. Truly Maniparna, Sunanda Pushkar had an illustrious career. Very frankly written on a topic abt which none is tlkin n voices r being silenced.v in india HV short memory n see n read abt so much violence each day that we HV bcom thick skinned.in fact,everywhr women r supposed to b shock absorbers n defend deir hubbies even if dey betray trust-hillary Clinton is most famous case. Hope Sunanda,a self made person for her every crore who WS unfairly subject to opposition taunts will b given justice fr she definitely did not deserve such a death. Being honest has its own repercussions. Yes, voices are being silenced. I was more concerned about Indian women & what attitudes, pressures and beliefs they have to succumb to... But, by presenting the Hillary Clinton example, you reminded that discretion, sacrifice & all qualities naive & nice are 'expected' from women around the world... Men have it easy. Just hope a fair trial is done and the guilty are held soon. It's been a week already. A loyal post.! Its sad how our country is shaping out to be! A heart warming..heart felt tribute indeed Anita! Loved your honest opinions & straight forward words. Sunanda's tragic end was unsettling. I think her illness as well as the turmoil in the personal life conspired together to take her life. Was it suicide? An accident? I can't say. I only hope it wasn't a murder. The question is- Will we get to know the reality? So many bruises on her body and her sudden death a few hours after the Twitter episode make me suspect foul play. Do hope the investigations are fairly carried out & there's justice for Sunanda Pushkar. I admire Sunanda Pushkar a lot for her honesty, class and courage. Hope light is shed on her death, though I shall refrain to criticize Dr Tharoor or Mehr, for that matter. Not just a self made woman but was charm personified. When she died, wrote something on her. Yes, Vishal. I share the same views about Sunanda Pushkar. However, all the people associated in this case like Dr Tharoor & Mehr are innocent till proven guilty. Hope the true killers are nabbed & punished. No misdeed should go unpunished .. A very courageous article on a lady well deserving. To me she symbolised grit,brain, a passion for life, zing and sunshine .. RIP Sunanda Pushkar .